As we constantly deny opportunities to love, the guardian of the mind fails to yield toward connection, to that sense of deep love that could significantly impact our life. Thus, the values and voice of Christ lay silent, losing touch with the very creator who resides within. Simply put, the impulse to change the world rests helplessly and doesn’t create a sense of empowerment. Our hectic life places undue emphasis on technical mastery and our lifestyle is toxic to those in need and pursuing the vital connections between the personal and public good. It’s not inaction that has the biggest impact on those surrounding us. It’s all the secondary issues — the lack of healthcare, the economic issues, unemployment and disruption of community that strips the soul. As the voices of our lives diminish, what will we say when asked, ‘Where were you?‘ As a Buddhist, there are no excuses. But how doe we embrace priorities those that enable the public good? Will we remain a threat to the environment? Will inequities in the distribution of wealth, lack of a sustainable energy policy remain only ideological dreams? Will our society continue to violate personal privacy and savor the predilection for excessive use of force? Truth told, most of us give, not out of a genuine place of hope to help and of generosity but rather via some transactional exchange, some sort of trade, as if we procured the right to go on with the day and not necessarily be bothered by bad news. An engaged Buddhist rests upon the insight that we must begin to change ourselves before we can help to change the world. The stories we tell about each other matter very much. The stories we tell ourselves about our own lives matter. And most of all, I think the way that we participate in one another life stories is of deep importance. Nelson Mandela said that the gift of prison was an ability to go within and to think, to create in himself the things he most wanted: peace, reconciliation, and harmony. Through this act of immense tenderheartedness, he became the embodiment of what South Africans call “Ubuntu.” Ubuntu: I am because of you. Each of us gets to experience the deepest parts of our own humanity through our interactions with others. In 2014 we must realize our own well-being is deeply tied to those surrounding us. Danger is shared. Pain is shared. Joy is shared. Laughter is shared. Achievement is shared. Houses are shared. Food is shared. 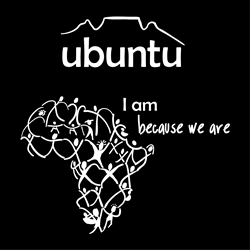 Ubuntu asks us to personally open our hearts and to share, and live with empathetic action in every moment. All of us are in the cathedral of life, we get to see the most beautiful parts of ourselves reflected back at us. All creatures (human or otherwise) share our best and brightest moments. If I have a gift to share, it’s a gift that provides more of me to society. Thus, I carry the very nature of love that God and Buddha profoundly proclaimed. We so often hear, “It’s only me, I can’t make a difference“, but great leaders of history showed that this is not true. Everybody can make a difference if committed.